EastEnders Spoilers: Is Tiffany Butcher The Next Person To Exit? EastEnders spoilers tease that there might be another devastating death in Walford in the coming weeks. As a matter of fact, new reports tease that Tiffany Butcher (Maisie Smith) might be the next person to go after Evie Steele’s (Sophia Capasso) exit. Here’s what you need to know. During the last episode of EastEnders, fans found out that Jack Branning (Scott Maslen) managed to convince Tiffany and Evie to speak to the police about their drug dealing. Jack told the pair that it would be better for them to cooperate than to cause any more trouble. Evie agreed. She gave the names of those running the business behind the scenes in exchange for protection and a new identity. However, the moment that she is set to leave Albert Square, Tiffany will struggle with the loss of her dear friend. She’s not ready to move on and will look to Jack for support. That’s when she asks him to deliver a letter to her so she doesn’t end up blowing her own cover. If there is anything she wants the most right now, it’s closure. EastEnders Spoilers – Will Jack Branning Agree To Help Her? If Jack does agree, that might put Tiffany in a dangerous situation though. That’s because anyone on Evie’s list might want to seek revenge on her. She’s already received a lot of abuse in recent weeks, so it’s without a doubt that they won’t be holding back. It will be interesting to see how she will cope in the coming weeks and whether or not Jack will be able to help her. Of course, fans will have to tune in to find out what will happen next! 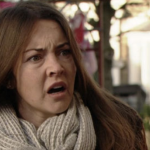 Eastenders airs weeknights on the BBC network. Check your local listings for times. And as always, let us know what you think by leaving us a line with your thoughts in our comments section below. General Hospital Spoilers: Sam Steals Precious Moment With Jason – JaSam Fans Overjoyed!